DALLAS, Dec. 6, 2017 /PRNewswire/ -- Texas Instruments (TI) (NASDAQ: TXN) today introduced the first operational amplifier (op amp) to combine ultra-high precision with the industry’s lowest supply current. 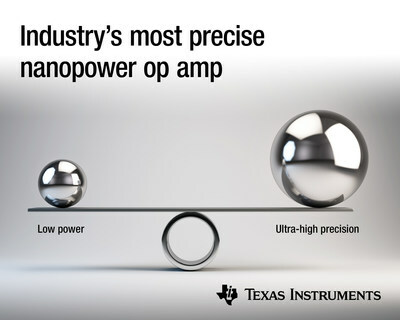 With exceptional power-to-precision performance, the LPV821 zero-drift, nanopower op amp enables engineers to attain the highest DC precision, while consuming 60 percent less power than competitive zero-drift devices. The LPV821 is designed for use in precision applications such as wireless sensing nodes, home and factory automation equipment, and portable electronics. For more information, see www.TI.com/LPV821-pr. The LPV821 op amp is the newest device in TI’s low-power amplifier portfolio, which enables engineers to design lighter, smaller and more portable applications with lower-capacity batteries and longer system lifetimes. Exceptional power-to-precision performance: Consuming only nanoamps of supply current, while providing the high-precision benefits of optimized offset, drift and 1/f noise (flicker noise), the LPV821 is extremely beneficial for applications where both precision and low power are essential system needs, including industrial gas detectors, field transmitters and battery packs. Sixty percent lower power consumption: With best-in-class supply current of 650 nA, the LPV821 extends battery lifetimes and enables lower power budgets in precision systems than competitive zero-drift devices. High DC precision: TI’s zero-drift technology delivers a low initial offset of 10 µV and an offset drift of 0.02 µV/°C, eliminating temperature drift and flicker noise, and enabling engineers to attain the highest DC precision and dynamic error correction. Additionally, self-calibration technology helps engineers save system development cost and speed time to market. No duty cycling: Nanopower consumption enables always-on applications such as continuous and blood glucose monitoring, and other electrochemical cell applications. Additionally, the low supply current decreases the external circuitry required to turn the amplifier on and off. High-impedance sensor operation: An input bias current of 7 pA and low flicker noise at 3.9 µVp-p enables operation with high-impedance sensors, delivering more accurate measurements in precision systems. Engineers can pair the LPV821 op amp with the TLV3691 nanopower comparator or ADS7142 nanopower analog-to-digital converter (ADC) to program a threshold that will automatically wake up a microcontroller (MCU) such as the CC1310 SimpleLink™ Sub-1 GHz MCU, further reducing system power consumption. Designers can download the TINA-TI™ SPICE model to simulate their designs and predict circuit behavior when using the LPV821 op amp. Engineers can also jump-start gas-sensing system designs using the LPV821 op amp with the Always-On Low-Power Gas Sensing with 10+ Year Coin Cell Battery Life Reference Design and Micropower Electrochemical Gas Sensor Amplifier Reference Design. Pre-production samples of the LPV821 op amp are now available through the TI store and authorized distributors in a 5-pin small-outline transistor (SOT-23) package. Pricing starts at US$0.80 in 1,000-unit quantities. Download the LPV821 op amp datasheet. Learn how to make precision measurements on a nanopower budget in this Analog Wire blog post. "Current Sensing in No-Neutral Light Switches." "Advantages of Using Nanopower, Zero-Drift Amplifiers for Battery Voltage and Current Monitoring in Portable Applications." "Simplifying Measurements in Power-Conscious Industrial Analytics Systems with Nanopower Op Amps." Learn more about TI’s zero-drift technology. SimpleLink, TINA-TI and TI E2E are trademarks of Texas Instruments. All other trademarks belong to their respective owners.